As some of you may be aware if you follow me on Twitter or have read my 'About me' page I do some work as a Supporting Artist. If you're not quite sure what an SA is this means I either appear in the background or may have a more featured, but non-speaking role in music video's, films, TV shows, commercial or whatever else I might be cast in. I'm not sure if this is something that will be of interest to my readers but I thought I might start doing some posts showing you what you can see me in. I don't get a lot of work and films and TV shows can often have a long turn around (for example, a film I shot last year isn't being released until 2015) but a post might pop up here and there if anybody is actually interested in reading them! 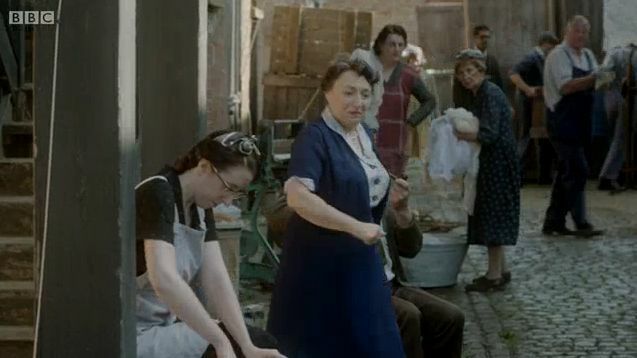 So for my first post I thought I'd let you know that I made an appearance in last Sunday's Call the midwife (9th Feb 2014 Series 3 episode 4). This was shot back in early September last year and my role was a laundry worker. This was actually a really good shoot as it involved two standard 12 hour days but on both days we stopped for lunch (on set catering is usually amazing! ), they then gave us a quick check over to make sure hair, makeup and costumes were all still correctly in place and then it was called a wrap for the SA's (wrap meaning we were all finished and could go home). With this kind of work there's always the chance that you might end up on the cutting room floor or may be just out of camera shot but in this episode I make three appearances. That's me walking away from the camera. The shot starts on a close-up of me using the mangle before I drop my washing in the basket and carry it down the street. In this one I'm drenching my legs with rather smelly, cold 'washing' water. Who said this kind of work was glamorous eh?! This time you got a shot of my face rather than my bum! It's a slight running joke with my boyfriend that it's usually my bum (actually my back) that ends up on camera rather than my face. Hopefully over the next couple of weeks two music video's I've recently worked on should be released and I can't wait to show them to you. 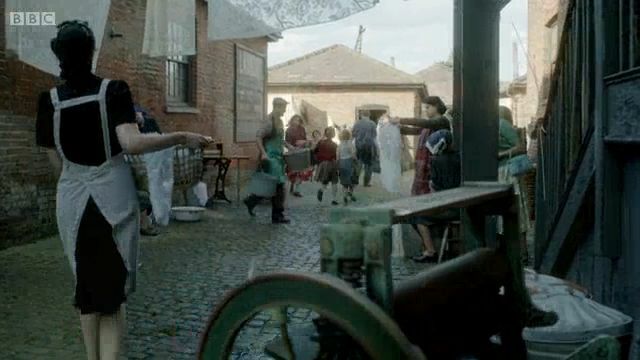 Did you watch Sunday's Call the midwife? That is so cool!! I'd love to do that. I'm so fascinated in how tv and film work!